With a distinctly British sound evoked by a yearning heart and the dizzy inertia of youth, TNF’s uproarious soundtrack to growing up is the product of small town dreams, failure, control and loss. Balancing melodic genius with lyrical brilliance, their grandiose yet melancholic sound features gospel choirs and orchestral strings, laced with an addictive pop sensibility that is at once haunting, beautiful, uplifting and heartfelt. The album follows two singles, ‘Fritter Away’ and TNF's debut release, 'Too Sad To Be Young’, an evocative exploration of music making that was well received in the media (see quotes below). Hailing from Brighton, TNF is fronted by singer and songwriter Will Charlton, whose sublimely controlled baritone croon sits a-top a wall of guitar and the orchestral arrangements of a band whose sound flits between tender and grandeur. Based around family, love and personal battles, youth and adulthood, and co-written with guitarist Sam Baldwin, the record’s fourteen reflective songs narrate Charlton’s different relationships as he relocated between towns and territories. Describing the content of ‘Me On You’, he states that "The tracklisting reflects the story. From beginning to end, I moved to Berlin to follow a European dream, had a break up and moved to Brighton not knowing where I really wanted to be. I wanted to write songs to close the chapter. The idea is that as well as being a narrative of the past, the album is also an account of my relations with other people." 'Me On You' is mixed and produced by Dave Izumi, who’s flair and flavour comes from his beautifully crafted Echo Zoo Studios in Eastbourne. “It's full of reel to reel tape machines, old synths, steinway pianos, a rhino’s head, a mousse’s head and Tony Visconti’s old mixer..." and sees the band reproduce their highly original songs, handpicked from late night sessions and hours of bedroom recordings and demos. 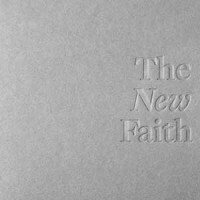 Two years and a day since Dave first heard the band and called saying he wanted to take on the album, The New Faith have created a peerless union of relatable lyrics, traditional songwriting and audacious arrangements; a stunning song-book filled with variety and colour.